On September 18th, 2010 the first Sodus Point outside historic mural was dedicated at a ceremony at the Sodus Point Firehouse. It depicted Native Americans Fishing in the 1450s near Chimney Bluffs outside Sodus Bay. 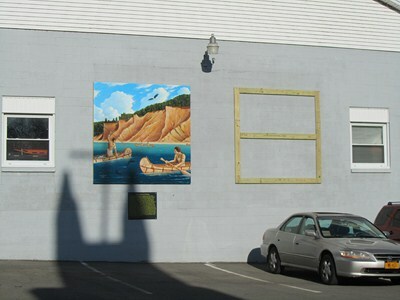 On June 18, 2011 the second outside historic mural was dedicated. This mural depicts the Battle of Sodus Point that occurred on the evening of June 19, 1813 during the War of 1812. During that battle, a group of approximately 50 patriots (a combination of poorly trained militia and local volunteers with no military training) fired into the lines of advancing British marines as they ascended the hill from the western shoreline. Although greatly outnumbered and fighting some of the best trained and battle hardened soldiers in the world, these brave Americans had the courage of their convictions to defend our village from the British incursion. Two members of the American volunteers died of wounds they received during the battle. Asher Warner died the next day and Charles Terry two weeks later. was just above and to the right of the Native American Fishing mural. Watching it for several minutes, he observed that the shadow of the cross moved at about a 45 degree angle from left to right. Based on this, he realized that earlier in the day it would transition across our first mural. 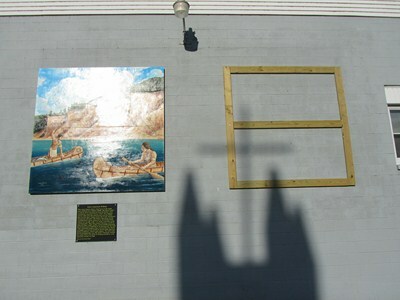 The nextday (May 9th) Bruce and his wife Edith did indeed observe this transition beginning at approximately 6 PM and lasting for about ½ hour as the shadow of the cross moved from the lower left hand side of the mural to the upper right side of the mural. It was very cool! As they watched the transition occur, the question came up as to whether or not the sun would move far enough to create a transition on the new mural later on. Unfortunately, this question would remain unanswered for 3 weeks as Bruce and Edith were away on a trip. During the time they were away on the trip, this question was debated quite a bit by them. On the second day of the trip, Bruce suddenly realized that the transition on the first mural occurred 45 days before the Summer Solstice (June 21) therefore the same transition should occur again 45 days after the Summer Solstice on August 3rd . Also these transitions would occur at the same dates every year as long as it was a sunny day. How cool is that! On June 1st (another sunny day!) they were back at the murals and anxiously awaiting to see where the shadow of the cross would go. To their delight, at 6:21 PM, the shadow of the cross was transitioning the mounting frame where the 2nd mural would be mounted on June 9th! By measuring the distance the cross had moved from May 9th through June 1st, Bruce was able to determine that it moves approximately 6.3 inches to the left per day. The next day (June 2nd) when Bruce measured the distance the cross had moved to the right he was surprised to find it had moved only about 3.5 inches. It was not moving the same distance each day but was in fact slowing down as it got closer to Summer Solstice. By going online and getting sunrise and sunset data in Rochester it also showed solar attitude in degrees at noon (http://www.timeanddate.com/worldclock/astronomy.html). Using this data, Bruce was able to recalculate how far the position of the cross would move. What he discovered was both shocking and wonderful! The shadow of the cross would move to a point not quite half the way over the second mural and basically stop moving any farther to the right. The date that it stops is around June 19th which is the anniversary of the Battle of Sodus Point! To add even another level of coincidence, Bruce calculated that the time that the transition starts (the top of the cross first touches the mural) on June 19th is 6:19 PM. It transitions that same spot (left to right at about a 45 degree angle) for about 4-5 days (June 19 – 24) and then slowly begin to move back to the left again having gone past the summer solstice! During these 4-5 days, the center of the shadow of the cross transitions over the most prominent American volunteer in the mural and touches every figure in the mural! As stated earlier, one of the American patriots who lost his life after being wounded was Asher Warner who was a volunteer. He died on June 20th. This is yet another amazing coincidence! 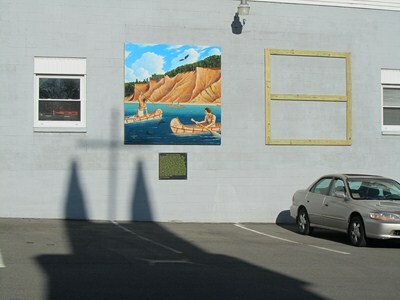 Between June 1st and the summer solstice, the shadow of the cross make daily transitions across the mural covering numerous locations on the second mural. At various times during that period, every figure in the mural will be touched by some part of the shadow of the cross. One final irony should be pointed out. 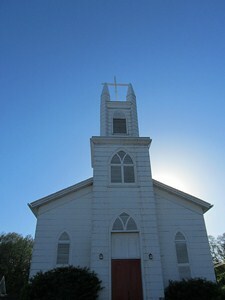 The Episcopal church, whose cross creates the shadow, is the American version of the Church of England! Extensive searching on the internet has led us to conclude that this is the only place in the world where something like this happens! Below are the times of the transitions. It should be noted that it takes a number of days for the transitions to totally cross a mural as they move only a few inches laterally per day. Collectively we have decided to call these transitions of the shadow of the cross on our murals as “The Blessing of the Murals”.